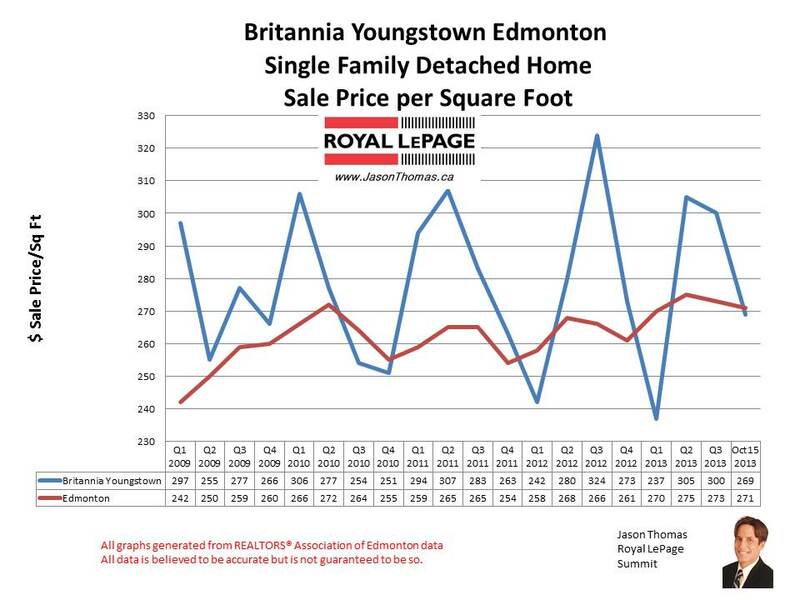 The Britannia Youngstown west Edmonton home sale price per square foot continues to vary, and is selling for $269 in October. This is only based on one sale though, so it could drastically change. I would expect Britannia's sale price per square foot to finish 2013 higher as it has had a couple of strong quarters where the selling price per square foot exceeded $300 this year. The highest sale price for a home in Britannia Youngstown in 2013 so far has been $378,000. The average time it takes to sell a house in Britannia Youngstown over the last 90 days has been 18 days. That is very quick, the Edmonton average days on market over the last 90 days has been 43 days.